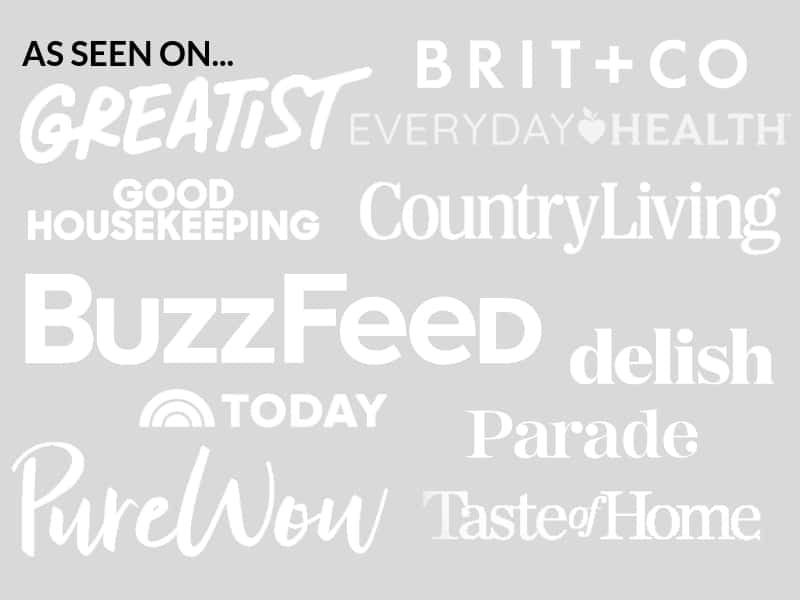 March 27, 2019 By Elizabeth Lindemann Leave a Comment / This post may contain affiliate links. 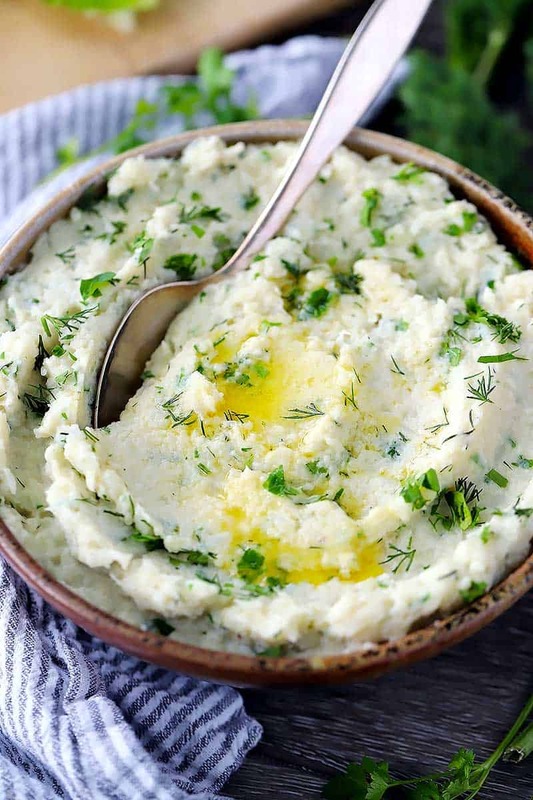 This Mashed Cauliflower with Butter and Herbs will be your new favorite low-carb side dish! It’s creamy and delicious, and a perfect recipe to enjoy all year round. The secret to making the BEST mashed cauliflower is adding lots of flavor, including fat. Salted butter, half and half, and a whole pile of fresh herbs make an appearance in this easy recipe. My other trick? Boiling the cauliflower in chicken stock (or veggie stock) with a generous pinch of salt amps up the flavor of the cauliflower before adding anything else to it! As it cooks, it absorbs all of those delicious flavors, giving this recipe a great base to work with. It’s absolutely delicious, and I promise you (and your kids!) will fall in love with it. Does mashed cauliflower taste like mashed potatoes? 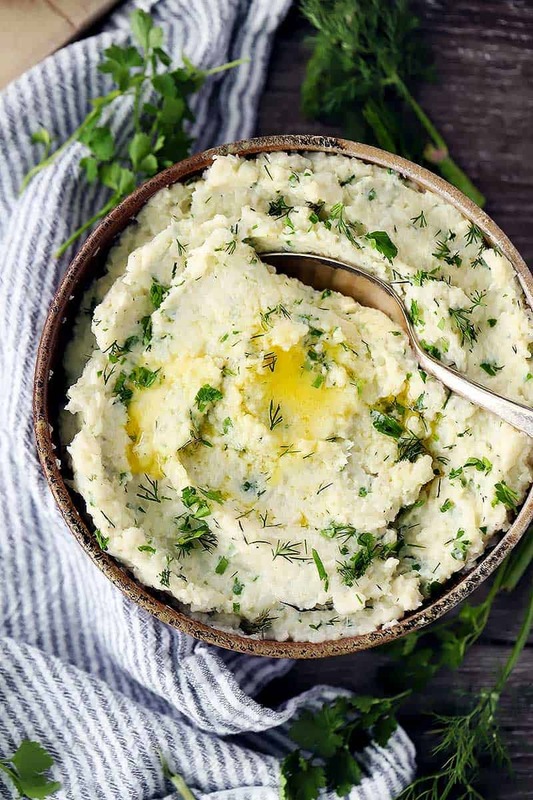 A lot of people will substitute mashed cauliflower for mashed potatoes if they are on a low-carb or keto diet. But I think this mashed cauliflower deserves better than to be only second to a potato. Don’t get me wrong- I love me some mashed potatoes. But I LOVEEEEE this mashed cauliflower, too! It fulfills much of the same purpose as mashed potatoes, and will soak up any delicious sauces or juices from steak, gravy, etc. But the texture and taste is much different than mashed potatoes. If you want the texture to be more similar to potatoes, you can puree the cauliflower using a food processor or blender. I always avoid this if I can, because I hate cleaning those appliances. I just used a potato masher. 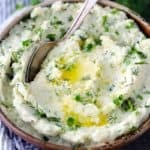 What should I serve with Mashed Cauliflower? 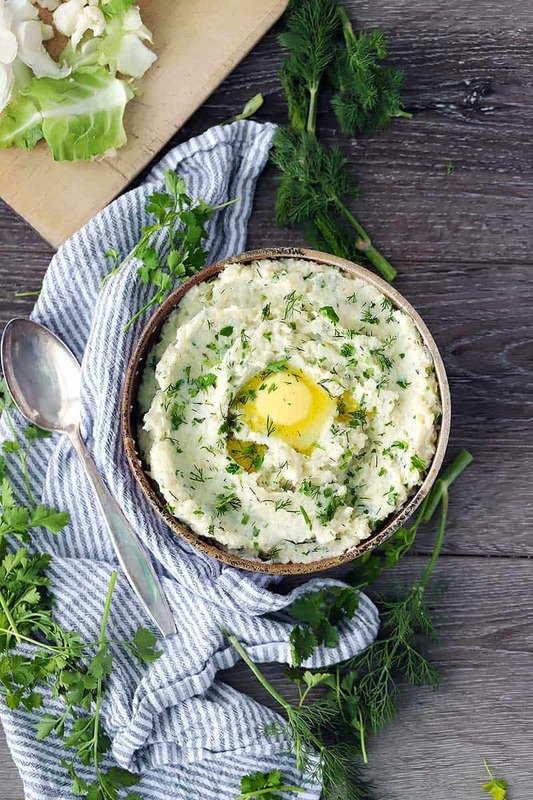 Mashed Cauliflower can be served with anything you’d normally serve with mashed potatoes. You can serve it with turkey and gravy, steak and browned butter pan sauce, or anything with a yummy sauce to help soak all of it up. We had it with honey mustard chicken. YUM. It’s also great as an alternative to mashed potatoes in shepherd’s pie! Can you freeze mashed cauliflower? Yes! You can easily freeze mashed cauliflower. It’s probably best to put it in a gallon sized freezer bag and try to get out as much air as possible, but an airtight container will also do fine. You can freeze it for up to three months. When you defrost it, keep in mind- some of the liquid may separate out from it and pool up. Just give it a good stir and it should be fine! Finally, this recipe is so easy to give it your own twist. 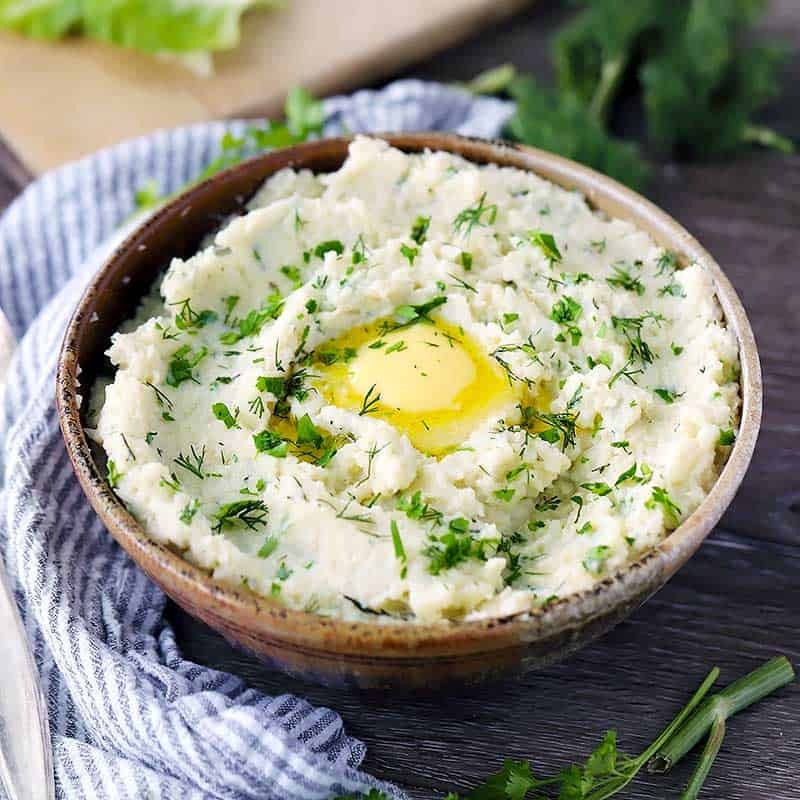 I’ve seen mashed cauliflower recipes made with garlic, cream cheese, cheddar cheese, and plenty of vegan or dairy free versions. You can easily make this one vegan, paleo, or dairy free by using vegetable stock instead of chicken, a plant-based milk or coconut milk instead of heavy cream, and olive oil instead of butter. 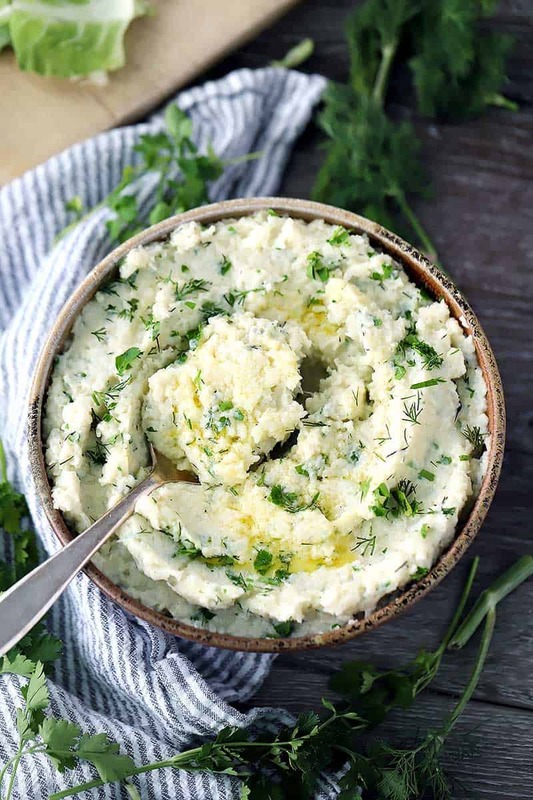 This low-carb mashed cauliflower with butter and herbs recipe will be your new favorite side dish all year round! Add the cauliflower and chicken broth (2 cups) to a large pot, along with a generous pinch of kosher salt. Bring to a boil, cover, and simmer on low for 20 minutes, or until cauliflower pieces, including any stems, are very tender when you stick a fork in them. Drain the cauliflower and add it back to the pot. Use a potato masher to mash the cauliflower to desired consistency. If you want it to be VERY smooth, use a food processor or blender to pulverize it. Add the butter (2 tablespoons), heavy cream (1/4 cup), and fresh herbs to the mashed cauliflower. Continue to mash (or blend) until all ingredients are combined. Season to taste with salt and pepper. Serve garnished with more herbs and/or butter, if desired. The smaller the florets are cut, and the fewer thick stems there are, the shorter time this will take to cook. To save time, buy pre-cut florets from your grocery store. Here's a great tutorial on how to cut a cauliflower into florets. You can use both the florets and the thicker stems. However, the stems will take longer to cook. I suggest making sure you allot more time for the recipe, and also cook the stems for about 15-20 minutes before adding the florets. For a vegan option, use olive oil instead of butter, vegetable broth or water instead of chicken, and plant-based milk alternative instead of half and half. The provided nutrition information is my best estimate. It does not include any added sodium from seasoning to taste, any optional ingredients, and it does not take brands into account. Feel free to calculate it yourself using this calculator or by adding the recipe to Yummly.